“In the two years that have passed since the tragic events of March 11, 2011, we have all experienced a range of emotions: grief at the terrible loss of life; inspiration from the remarkable resilience of the Japanese people; gratitude for the international outpouring of support for Japan; and determination to build a stronger, even more prosperous country out of the ruins of the disaster. The most important emotion, however, is hope. “While we will never forget the events of that day two years ago, we also look forward to a brighter future for Japan. There are undeniable signs of progress throughout the affected area. We see hope in the eyes of the young boys and girls from Tohoku who are planning their future careers. We see hope in the imagination of local entrepreneurs, seeking innovative ways to improve their communities. And we see hope in the faces of the teachers, the police officers and firefighters, the civic leaders, and citizens from all walks of life who are committed to rebuilding their towns and their lives. 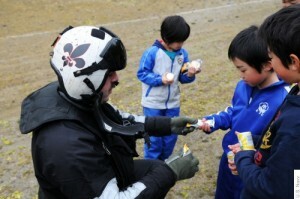 “Two years ago, Japan endured unimaginable disaster following the earthquake, tsunami, and nuclear crisis of March 11, 2011. As we remember the tragic events surrounding the Great East Japan Earthquake, and mourn the victims, we also recall that the world marveled at the resiliency and dignity of the Japanese people as they worked to overcome the tragedy. “Over the past two years, Japan has made steady progress in its recovery and rebuilding efforts – and I’m pleased that the United States has been able to play a role in this process. “The partnership between the United States and Japan is built on the bedrock of our shared values, and one of those values is that we help each other in times of need. Just as Japan came to our aid after disasters such as Hurricane Katrina, we in the United States did not hesitate to lend a helping hand to Japan after March 11. “The seamless cooperation between the U.S. military and the Japanese Self-Defense Forces during “Operation Tomodachi” – named after the Japanese word for “friend” – helped tens of thousands of people, and demonstrated to the world the deep and enduring strength of the U.S.-Japan Alliance for peace. Looking forward, our “TOMODACHI Initiative” is a public-private partnership that continues the same spirit of friendship by increasing bilateral exchange between young Americans and Japanese.